Can AI revolutionise the banking sector? Artificial Intelligence (AI) is an over-used phrase reflecting a genuine convergence of a number of technologies and methodologies. The banking and Financial industry as a whole has invested heavily in technology for a long time, and as the industry shifts from being led by large financial institutions, to one that is increasingly driven by disruptive FinTech companies, innovative technology is high on the agenda across the board. In banking specifically, the majority of use cases are in mid-level, rather than customer facing or operational roles. However, this will change over time as AI becomes more "customer facing", and ultimately more consumer orientated as a whole. Autonomous agents, algorithms which essentially act on behalf of a human, are the most well publicised example of Artificial intelligence in use in banks today. Autonomous agents are typically a software agent who can do three main things: understand the world in front of them - in particular put a problem into context, how to change that problem - using the information which is available to them, and finally how they’ve changed the world and therefore continue to learn and develop. More specifically, banks are using AI to track market patterns and to quickly and reliably react to them. A recent report by Thomson Reuters estimates that algorithmic trading systems now handle 75 percent of the volume of global trades worldwide and this figure is predicted, by those in the industry, to grow steadily. For autonomous agents to be successful in the banking world, they need to have the ability to perceive the world as it pertains to their area of responsibility, to be able to predict the outcome of actions with some success, and to be able to take actions independently. Their ability to learn also relies upon their ability to observe the actual outcomes from actions they have undertaken. One of the drivers for all the attention around AI in the banking sector at the moment is its ability to increase transparency, accessibility and standardisation of data. For instance when analysing data about publicly traded assets, "training data" is widely available and in a standard format. This makes it possible to build and train an algorithm which can make predictions as a human, execute transactions, observe results and learn over time. Other examples of AI exist in systems banks used to provide an objective and unbiased view, for instance monitoring natural language communications between staff to ensure compliance, or detecting fraud from transaction data. A key area of growth for AI in the banking sector is the implementation of "bots" which use natural language processing to integrate with legacy or external systems, collating and presenting data based on the user's role and context, and even talking to multiple humans to ensure actions are completed. These will soon start to replace the more administrative elements of many knowledge based and middle management roles. For example, an autonomous agents is able to manage the to-do list ensuring that the employee is as productive as possible and eliminating the admin tasks. In practice, through the agent’s experience of a company, is able to allocate tasks to employees who are more specialised for a role or task. Alternatively the agent is able to seamlessly connect two employees when both are available. When these bots become more mature, they can start to be exposed directly to customers - something which is already happening and leading to the replacement of some roles in some customer contact centres. A recent Forrester report suggests UK banks will start implementing these chat bots over the next two years. Where currently humans are managing humans through a multitude of set processes – in the future autonomous agents will be able to replace this process using similar techniques to the chat bots. By 2020 Piccadilly Group aims to replace mid-management level roles in some banking IT roles using autonomous agents. By using autonomous agents for human-to-human mid-level management roles, senior management is then able to focus on the more complex problems which aren’t able to be solved through following repetitive processes. At the moment all of the current focus is very much on the enterprise and the benefits AI can bring to the banks. From a consumer perspective however, change is definitely still coming. Currently it would be hard to implement an autonomous agent that could manage your personal day to day finances within a large range of financial bodies. This is because the autonomous agent has to understand how to talk to each bank separately (and the bank has to spend money to make the data available). A significant disruption here will be the implementation of the CMA’s Open Banking decision last year which will enable tech firms to access your historical transaction data, or product details and make transactions on your behalf. This will open up UK retail banking to competition from the tech sector in an unprecedented way. In the context of AI, it will suddenly provide a standard mechanism for an autonomous agent to observe your financial behaviour and once this happens, we will start to see rapid adoption of agents which give you financial advice and combine your data with other data points to provide a highly personalised experience. Similarly, a recent report by Accenture, Banking Technology Vision 2017, argues that AI will help retail banking create a more human-like customer experience, rather ironically considering the majority of people feel that technology is leading banking to become more and more automated and less and less personal. 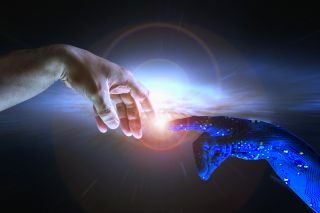 The report also found that as consumers are becoming more used to AI and according to Salesforce’s 2016 Connected Customer report, 57 per cent of business buyers and 45 per cent of consumers say that by 2020 they will switch brands if a company doesn’t actively anticipate their needs. Big changes are coming in the retail banking sector and it will be the early adopters that have the most to gain from embracing this new and exciting wave of technology.